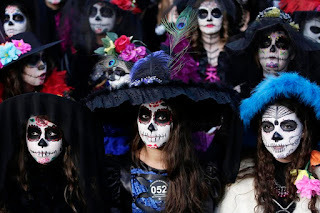 At once both solemn and festive, the day is mainly celebrated in countries with large indigenous communities, such as Bolivia, Mexico, Ecuador and Peru, where pre-Hispanic traditions survive. Customarily, these traditions hold that the spirits of the departed return this time of year, and families welcome them back by erecting altars at home with the personal items or favorite foods and beverages of the deceased. Families also visit their local cemeteries, usually from the night of Nov. 1 throughout the following day to clean their tombs, place fresh flowers, light candles and even share a meal with the visiting souls. Unlike most Western countries, where visiting the grave of a loved one is a solitary affair that takes place on the anniversary of the death of each individual, Latin American societies remember their deceased ones in a community. This communal aspect lends a festive, carnival-like atmosphere to what would otherwise be a sedate and even sad occasion.